In July 1940, Hitler ordered that preparations be made for Operation Sealion, the planned invasion of Great Britain. The German Intelligence Service (Abwehr) scrambled to place some spies in Britain who could report on coastal defenses, troop movements and the weather. Naturally the spies would need to be able to report their findings back to the Abwehr headquarters. 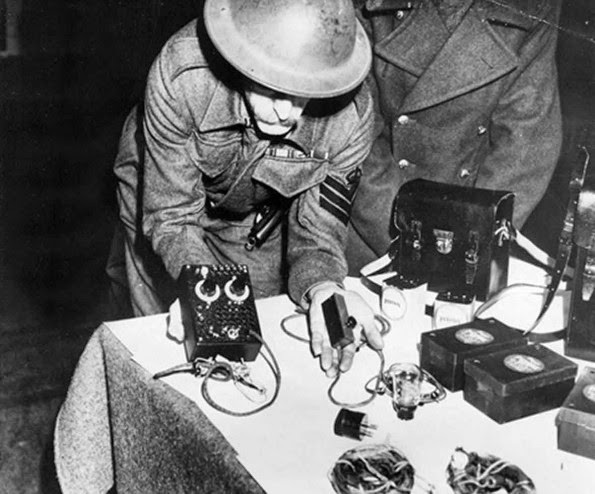 Letters written with secret ink would have taken too long to arrive, so the spies were equipped with wireless radio transmitters. morse key in the hand of the soldier). In early September 1940, four German spies (three of whom were Dutch nationals) landed from two small boats along the shore of Kent. The four men were caught within 24 hours and were found to be carrying wireless transmitters. One of them had even managed to send a few radio messages to Germany reporting their successful landing. the morse key is different from that in the photo above. Kieboom and Pons, who had landed several miles away from Waldberg and Meier, were equipped with an S 88/5 transmitter ("S" stands for "Sender" or "Transmitter" in German) but had no receiver. They could send messages to Germany but would have been unable to receive any messages. 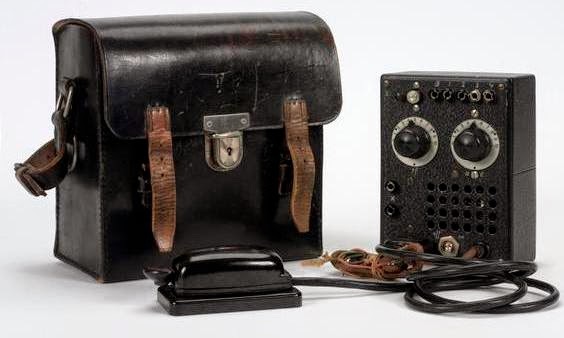 Their radio and the associated batteries were contained within two leather camera cases. 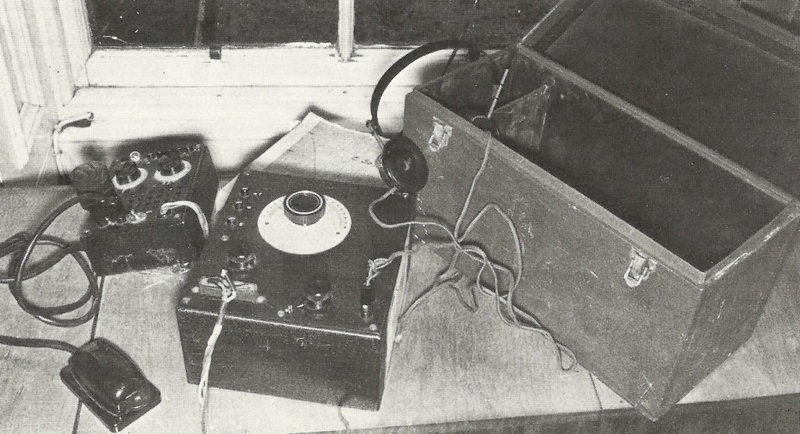 Waldberg and Meier, who had landed farther down the beach were also equipped with a radio but apparently theirs could receive as well as transmit messages. As these were the first confirmed German spies to be captured on British soil since the start of the war, there was quite a bit of excitement about their capture, which was widely publicized. All four men were tried under the Treachery Act (1940) in November and all were found guilty with the exception of Pons. He convinced the jury that he had acted under duress because of threats from the Gestapo. Waldberg, Meier and Kieboom were hanged at Pentonville Prison in December 1940. At the end of September, three spies climbed out of a flying boat off the coast of Banffshire, Scotland. The two men and three women struggled to transfer their bicycles from the aircraft into their rubber dinghy. Eventually the bikes fell overboard and quietly sank to the bottom of the ocean. Undeterred, the three rowed for shore and landed between the villages of Port Gordon and Buckie. After a hurried conference, the trio split into a pair which headed for Port Gordon and a lone man who headed for Buckie. Within 24 hours, all three were in the hands of the Scottish police. Robert Petter (alias Werner Heinrich Walti), Vera de Cottani de Chalbur (alias Vera Erikson) and Karl Theo Drücke (alias Francois de Deeker) were relieved of their possessions which included two wireless transmitter/receivers. Karl Drucke's SE 88/5 transmitter/receiver. (former Chief Constable of Edinburgh). 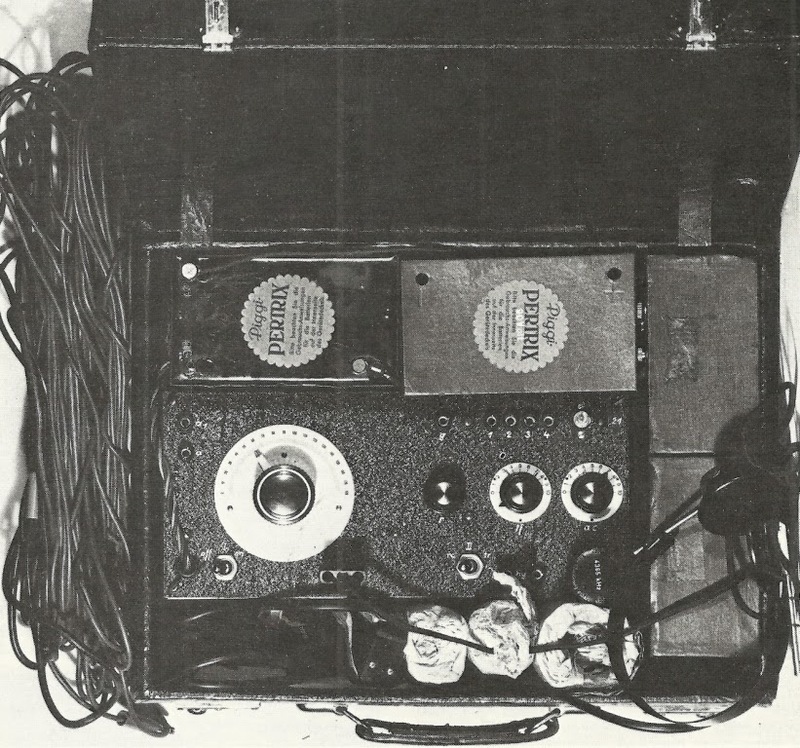 Karl Drücke's transmitter/receiver was an SE 88/5 packed within a sturdy wooden box ("SE" stands for "Sender/Emfanger" or "Transmitter/Receiver" in German). He and Vera Erikson also had a couple of circular cardboard code discs, several batteries, two radio valves, a voltmeter, a set of headphones and a Morse tapping key. & receiver in a fibre-board suitcase. Robert Petter also had a wireless transmitter/receiver, this one contained within a black fibre-board suitcase. It contained a similar transmitter/receiver (SE 92/3) with a several aerial wires. When Josef landed in the fields near Ramsey on the evening of January 31, 1941, he too was equipped with a radio transmitter/receiver. Josef's set would have been housed in a similar attaché case. His set was also contained within a black (or blue) imitation crocodile (fibre-board) attaché case. The case measured 16" x 11.5" x 5.5" and the two clasp locks were marked 155. MI5 requested a detailed analysis of Josef's set from L.W. Humphreys of the Radio Security Service. Based on that description, Ben Nock of the Military Wireless Museum has helpfully identified Josef's set as an SE 88/5 - identical with the sets carried by Karl Drücke and Jose Waldberg. with two quartz crystals. The first was marked "T" (for "Tag" or daytime) and was placed in the working position in the transmitter. It would have been used for Josef's daytime transmissions between the hours of 8 am and 10 am. The spare crystal was marked "N" (for "Nacht" or nighttime) and would have been used by Josef during the hours of 8 pm and 9 pm. The spare crystal was plugged into the morse key sockets. Humphreys noted that had the set been inadvertently turned on, the spare crystal would have fractured. Other than that, Humphreys said the set worked very well and the controls were smooth and stable. The set was powered by three Piggi-Pertrix batteries connected in series. Theoretically, if Josef had used his set for 15 minutes a day, the batteries would have lasted for about a year. Shorter transmissions were the best for longer transmissions increased the risk of detection. Amateur radio operators (and official ones) were listening for illicit transmissions. Upon hearing one, they could determine the direction of the strongest signal and, if the signal was picked up by several stations, the authorities could use triangulation to determine the transmission's source. But in the end, Josef never had a chance to use his radio set, neither as a spy nor as a double-agent. The location of Josef's radio set is unknown. It was confiscated by MI5 in 1941. While some sets in the possession of MI5 were donated to the Imperial War Museum after the war, many of the sets have simply disappeared into the mists of time. After the Battle Magazine, Volume 11, 1976. National Archives, Security Service file, KV 2/26.